The detritus of industrial civilization includes endless supplies of PVC piping — a miracle material which is for the most part non-toxic, as long as you avoid breathing it as a dust or burning it and breathing the fumes. While they’re generally too heavy for stamping tubes, these pipes can be turned into flutes and trumpets very easily. It’s very simple to get a short length of pipe and make a lip-buzz into one end, eliciting the fundamental or one of the lower harmonics. But to get a really complete overtone series, you need a much longer tube. Look at all the piping in a brass trumpet and imagine it spread out in a line and you’ll get the idea. If you are aiming for a versatile natural trumpet, you’ll have to do some “joinery” to get a longer tube length that is still manageable. An open-holed flute is even easier. The “Overtone FLute” relies on controlled overblowing to generate the harmonics of the available fundamental tones. If you know how to traverse the overtone series, you can create complete melodic passages with only a few fingerholes. 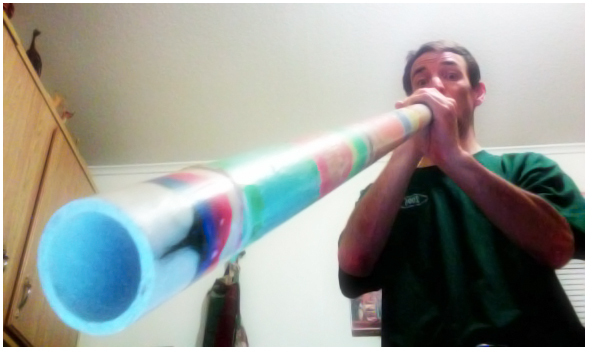 One of the easiest instruments to make from PVC is a didgeridoo. While the technique is challenging (circular breathing is not a simple thing), the instrument itself is a snap to make.